Chicago Southland CVB - Chicago Southland Cuisine: Chicago Southland Cuisine: Pizza, Farm-to-Table, Chicago Style Hot Dogs, Sweet Treats and more. 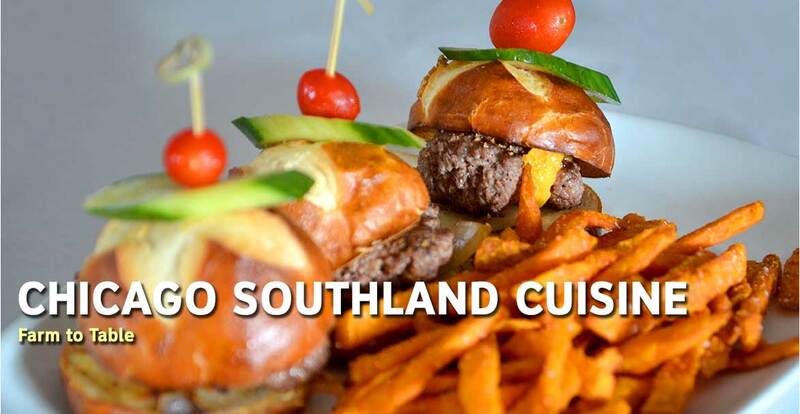 Chicago Southland Cuisine: Pizza, Farm-to-Table, Chicago Style Hot Dogs, Sweet Treats and more. Never, and I mean NEVER, ask for ketchup on your hot dog! Where can you find a good Chicago-style Hot Dog? 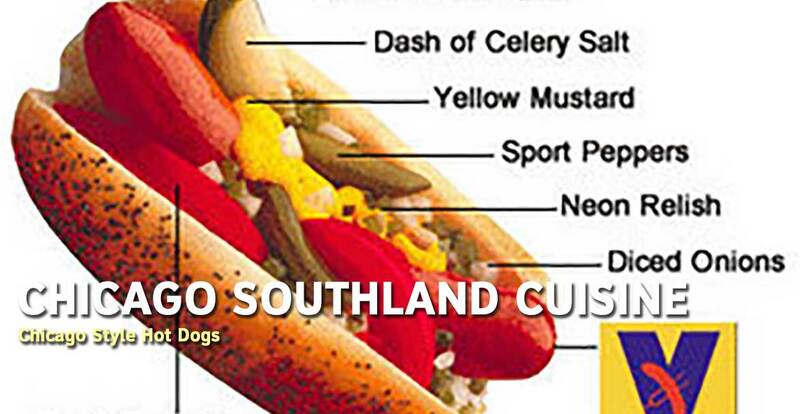 To build a proper Chicago-style Hot Dog, click here. Farm-to-Table refers to restaurants that source their food as locally as possible, use hormone-free meat products and non-GMO plants in the production of your meal. Being in the Midwest in the winter is a unique challenge and our farm-to-table restaurants will source only the freshest ingredients. Tin Fish (18201 South Harlem Avenue, Tinley Park) flies in its fresh seafood six days a week and creates menus with offerings from land and sea that emphasize seasonal ingredients. The Harvest Room (7164 West 127th Street, Palos Heights) goes out of its way to create fresh recognizable dishes made with local, organic or organically raised ingredients from area farmers when possible. The restaurant opened in early 2013 and has been receiving rave reviews ever since. They say Chicago Style Pizza is royalty. What they don’t know is that in the Chicago Southland, it’s KING! Rich’s Pizza Joint in Tinley Park offers a unique perspective into Chicago History with award winning pizza that strays from the path of convention. Offering a four cheese blend with garlic butter sauce in lieu of the traditional marinara, the I-Atey boasts a new style of crust aptly named the Chicago 2 Flat. Two Layers of thin crust with melted cheese in the middle will deliver your taste buds into a frenzy of deliciousness. All hail the king indeed. 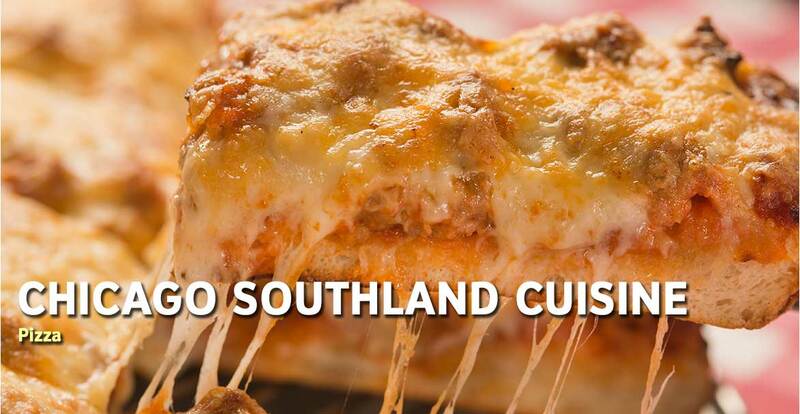 From thin and thick crust pizza to the classic Chicago-style deep dish, the Chicago Southland has a variety of pizza offerings. Aurelio’s Pizza (18162 Harwood Avenue, Homewood & 15901 South Oak Park Avenue, Tinley Park) is a Chicago Southland classic. Opening in 1959 in Homewood, Aurelio’s is one of the best examples of Chicago pizza. If you happen to visit the original location in Homewood, be sure to ask for your pizza to be cooked in the old oven, trust us! Aurelio’s also offers gluten-free pizza. Beggars Pizza (3524 Ridge Road, Lansing) is housed in a renovated theater and features live organ music on Tuesday and Friday nights. Rich’s Pizza Joint (7020 West 183rd Street, Tinley Park) is across the street from the Tinley Park Convention Center serves award winning pizza along with daily specials. Rich’s Pizza Joint offers indoor and outdoor seating, weather-permitting. Looking for a popcorn fix? Check out one of the Chicago Southland’s finest popcorn and confectioner shops! Of course, don’t forget about a Chicago classic, a CheeseCorn and CaramelCrisp flavor mix, the Garrett Mix, at Garrett Popcorn Shops. Rock out with your Big Mac at a unique Rock and Roll McDonald Diner in Olympia Fields. They have a set schedule of bands throughout the week and most Wednesdays you can hear Steve Lydell singing a variety of music from the 1950s to the 1970s. Country music with your fries on Thursday will make you kick your boots. Sing your best impression of, “I’m Lovin’ It” on Friday night when a DJ hosts karaoke fun. They just recently started offering table service with a hostess on Saturdays and Sundays from 9AM-1PM. The most popular menu item is the new Strawberry Hotcakes, which is rare to the area and is a platter of hotcakes with strawberries, cherries and whip cream. Saturday night has a variety of entertainers, which are updated in the store each month. Take a picture with the Elvis statue to complete your fun trip to McDonald’s. The music and food will certainly make this a Happy Meal!